This morning, nearly 100 students from Middleton High Schools and UW-Madison engaged in Socratic Discussions of Enrique's Journey in a half-day event sponsored by the Greater Madison Writing Project. Press Release. The morning kicked off with remarks by Professor Susan Robinson from the School of Journalism and Mass Communication. Robinson discussed the emergence of literary nonfiction as a genre, situating Nazario's book in a long tradition of storytelling as a way to discuss social and economic ills. Writers of literary nonfiction incorporate elements of myth and narrative to create compelling story - Enrique's story is structured as an Odyssey. As an award-winning journalist, Nazario balances the techniques of fiction with the task of a journalist. She is bound by the ethics of her profession, for example her commitment to include background information and to not intervene in the story she is reporting. The next segment of the program was devoted to Socratic Discussions. 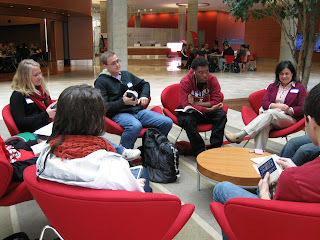 Students were assigned to discussion groups that spread out throughout the Wisconsin Institutes for Discovery. Each discussion group had a pair of facilitators from a UW Madison English 100 class that was also reading the book. English 100 instructors provided their students with coaching on how to lead the discussions, so during the event these facilitators were truly leading groups of high school students. All of the groups seemed very focused on their discussions: students had their books out and it was exciting to see just the kinds of conversations we hoped Go Big Read would foster. After a short break, Professor Petra Guerra, Associate Director of Chican@ and Latin@ Studies, talked with the full group about the importance of learning about issues in depth and becoming media literate. Guerra congratulated the students on reading Enrique's Journey to develop a more nuanced understanding of complex issues related to immigration. She also talked about how immigrants are portrayed in the media, and the fact that stories like Enrique's, which is really about coming to the U.S. in search of a better life, are told much less frequently. Guerra suggested that students seek out quality media about immigration such as Under the Same Moon, Sin Nombre, and Lost in Detention, to continue to become more informed. 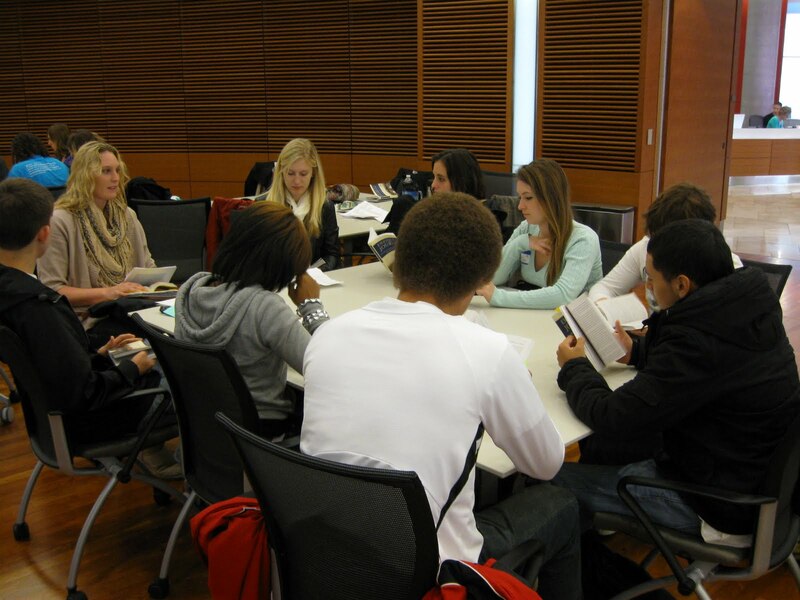 Program organizers included the Greater Madison Writing Project, Middleton High School and Middleton Alternative High School teachers, and UW-Madison English 100 instructors. These organizers and the English 100 students who facilitated the discussions did an amazing job fostering discussions and learning. 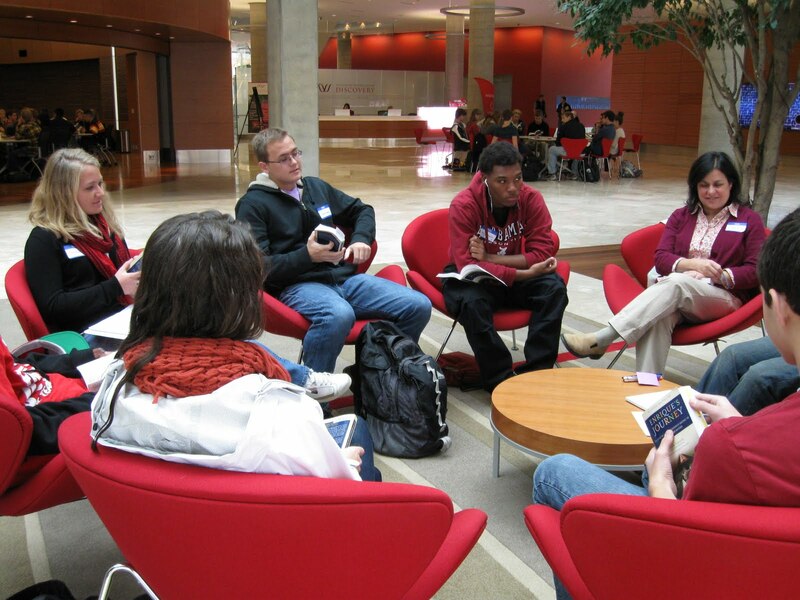 And it was great to see high school and college students on campus together, discussing books and ideas, and enjoying the Wisconsin Institutes for Discovery.